Laurie Potter, of whom more later, was born in Canada and lives in Nova Scotia. In World War II, Laurie’s father joined the West Nova Scotia Regiment of the Canadian 1st Division, serving in Italy and the United Kingdom. 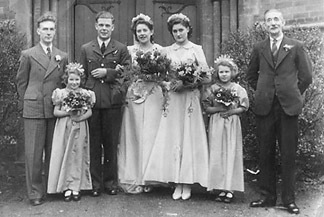 While stationed in England, Potter senior met the English girl who was to become his wife, Margaret Kearns. Her brother George Kearns had joined the RAFVR in September 1939—he qualified as a Wireless Operator/Air Gunner on the Bristol Blenheim. In early 1941 George was the Gunner in a crew ferrying a Blenheim IV out to Greece. There he was posted to join 211 Squadron. What follows is George’s own account, with any amplifications of mine shown in the customary way [thus]. A great official shot, on the ground in Greece. The aircraft seems to be Blenheim I UQ-D (but not L8376), while the foreground and background have the look of Paramythia about them. “We also ferried personnel from Paramythia to Agrinion from 12 April to 14 [April] in Blenheim L4818 [possibly L4878] after that we evacuated personnel from Greece to Crete from 21 April until 23 [April] in Blenheim L1386. When things settled down we were sent to Aquir in Palestine for operations against the Vichy French. After four operations in Blenheim N3581, V5790 and V5866 [all Mark IVs and formally of 11 Squadron] we were transferred to XI Squadron and that as far as I knew was the end of 211 Squadron. A magnificent official shot. As a full Colonel gingerly descends the Blenheim’s wing-root foot-way, George observes uneasily from the aft hatch of an anonymous Blenheim, most likely a Mark IV. Notably, George’s turret is a rare example of the single-Browning mounting. In all, George had flown 48 operations in the Middle East, 11 of them in some four months with 211 Squadron, the balance with 11 Squadron and the Strategic Reconnaissance Unit. While with the 211s in Greece and Palestine he was known as Curly. The period in which George served with 211 Squadron was quite difficult for a number of reasons, not least the loss of 16 men in 6 experienced crews in the desperate Easter Sunday operation against the advancing Germans on 13 April 1941. Then, on the point of departure form Greece, their secret documents were ordered to be destroyed. The formal Squadron record for the latter days in Greece is thus pretty sparse, with the Operations Record Book from March and April 1941 lost, to be re-compiled in rather less than usual detail once they were operational again in Palestine. Many of the 211s, George among them, also lost kit and mementoes in withdrawing from Greece. On moving to Aquir in Palestine after the battering by the Luftwaffe over Greece, the Squadron regrouped and resumed operations in May. Although the formal record of the time is still less complete than usual, the monthly summaries at least are once again recorded in something like customary detail. At Aqir, the Operations Record Book for late May records one sortie over Syria against the Vichy French, identifying JCR Hooper and his crew Page and Kearns by name. And two other sorties are very likely theirs too, though only Hooper, as pilot, is named (a not unusual short-hand). Given the circumstances of the time and the state of the formal records of the Squadron, it is not surprising that these are the only Squadron Operations Record Book entries for George, his arrival apparently having gone unremarked in the press of events at Paramythia. The March/April/May 1941 period had been very difficult for the Greyhounds in every way. P/O Jeffry Campbell Ross Hooper 89777 had joined 211 Squadron with his brother, P/O John Gower Martin Hooper 89778, pilots in a draft of fresh aircrew on 23 January 1941. The pair were from Southern Rhodesia. Having joined the RAF in 1935 and 211 Squadron as groundcrew in the UK in 1937, Len Page remustered as an Air Gunner. By the time the Italians joined the war in June 1940, LAC Page was flying as an Observer, and duly accorded Sgt rank by September 1940. 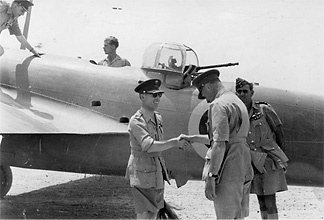 By mid-1941 he had completed 55 sorties with 211 Squadron over Libya, Albania and Syria and had been awarded a DFM. 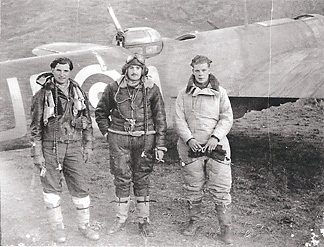 Hooper, Page and Kearns were then transferred to XI Squadron as a crew. After further desert operations with XI Squadron, in late 1941 they joined the Strategic Reconnaissance Unit as a crew, flying four-man Martin Marylands, Sgt Hall joining them. After a number of successful Desert sorties, Hooper was wounded by flak over Benghazi in Maryland II AH370 on 6 December 1941. Sgt Observer Len Page took control of the aircraft. Curly Kearns and Sgt Hall, offered the option of jumping for it, elected to stay aboard with their crew mates. Hooper recovered enough to land the damaged Maryland, in a sandstorm, with Page’s assistance. Hooper was awarded an immediate DFC and Page was awarded an immediate Bar to his DFM (one of only 60 awarded in World War II). Hooper, recovered, went on to complete a tour on Mosquitoes over Europe, ending the war a Flt Lt. Commissioned in 1943, Len Page completed a tour of operations over Europe as Observer with 605 Squadron on Mosquitoes, for which he was awarded a Mention in Despatches. Flight Lieutenant Leonard Robert Page DFM+Bar left the RAF in 1945. His awards are recounted by Graham Pitchfork in his wonderful Men Behind the Medals, along with a nice vignette of 211 Squadron’s Greek Tragedy. 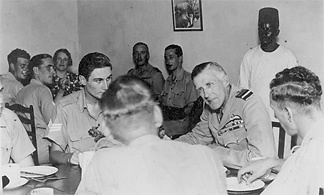 Characteristically of the old 211 Squadron aircrew, in later life George was disinclined to make too much of his four months and 11 operations with them in Greece and Palestine. Besides, his time with XI Squadron naturally had strong claim upon his affection, too. Whichever way you look at it, carrying out 48 operations in day-bombers against an aggressive enemy required determination, skill, bravery and considerable luck. We in the 21st Century are fortunate indeed to have the acquaintance of such men—those ordinary young fellows who in dangerous days stepped forward from civilian life to do very extraordinary things. George and his late wife Ann emigrated to Canada in 1968. He was to work on equipment maintenance in the nickel mining game, which took him to the North of Manitoba, where he continued to live, a widower in retirement. He was 91 when he and Laurie Potter got in touch. In August 2009, brother Stan from England flew to Canada to visit George and their surviving third sister, Eileen, who also lives in Nova Scotia. It was their first get together since 1964. Margaret and their elder sister Lilly had passed away earlier, but Laurie Potter, as Margaret’s youngest son, also took much pleasure in being part of the celebration. Over the course of the visit, their talk turned to the war years. It turned out that George had heard little news of his old Squadron over the years since. A little research on the internet soon put Laurie and his Uncle George in contact with me. The Kearns and Potter families are very proud of George, and of his war service. In little Flin Flon, far North in Manitoba, George took life as it came, good or bad, ever with good cheer. Undaunted by a house fire in the late Winter of 2010, he set about having his home rebuilt. Having moved back home, he later remarked to me that “worse things happen at Sea”. And so to the final journey. George fell ill in the Spring of 2011 but remained in Flin Flon, his home of 40 years. Having just reached his 93rd birthday, George departed this life peacefully on 29 August. He was laid to rest in the Ross Park Cemetery at Flin Flon on Thursday 1 September 2011. George will be much missed. It has been a pleasure and a privilege to know such a man. G Pitchfork The Men Behind The Medals (Leo Cooper 1998) Ch 8 From Greek Tragedy to Night Intruder, previously published in Flypast, January 1996 under the pen-name Ralph Graham.